My mother is a handful. 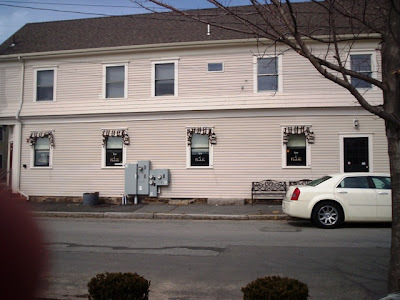 We have been trying to visit a certain Fairhaven breakfast restaurant for a while now, but each attempt has been foiled due to my mother either not leaving the house, or leaving minutes before the restaurant closes. Today, the latter of the two happened. We left the house with what she thought was plenty of time, only to arrive there and see a waitress taking in the outdoor furniture and turning the “open” sign to “closed.” Thanks, Ma. You screwed me out of an omelet – again. Before I had a chance to get an attitude about my lack of breakfast, Mom suggested that I use my GPS to direct us to another restaurant. 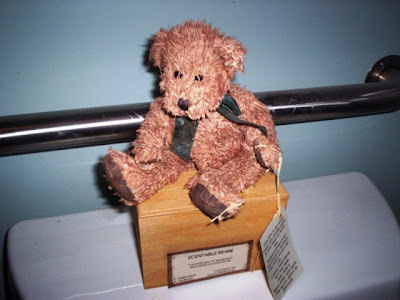 One of the first things that came up was Elisabeth’s, located only minutes from where we were. When we pulled up to the restaurant, Mom’s memory was suddenly jogged. She had read about Elisabeth’s on the Internet, and the reviews had all been positive. Since we were up for an adventure, we agreed to take a chance. We entered at just before 1 p.m. When we stepped inside the restaurant, we noticed that there were only a few people inside. Elisabeth’s had only been open for a few hours, so we figured that more patrons would be coming in as the day went on. We were told to seat ourselves – something that Mom loves – so we chose a table at the very back of the restaurant. A waitress, who we later learned was named Rochelle, approached our table and poured two glasses of water with lemons. We rarely see this done anymore, and it’s always nice to be reminded that some restaurants actually care about presentation and good service. 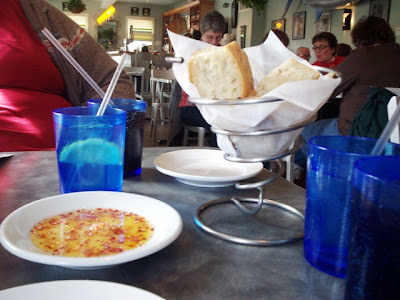 She also brought over a wire basket with delicious artisan bread and a plate of savory dipping oil. Rochelle then took our drink order – two diet colas ($3.50) – which quickly arrived in real glasses. When we had first arrived, Rochelle presented us with two lunch menus filled with light, mid-afternoon favorites like sandwiches, pizzas, salads, and appetizers. When Mom and I finally made our decision, Rochelle came back to take our order. Mom chose the English style fish and chips ($8.95), and I chose the feta pizza ($5.25). Actually, there were several dishes that we were torn between, so our decision to choose these items happened at the very last minute. Rochelle took away our menus and left us to check out the interior. Elisabeth’s is quite pleasing to the eye. It has a very trendy yet soft interior. Think Not Your Average Joe’s, but less hectic. However, I think that we just hit it at a good time. Elisabeth’s seems to be the type of unique hot spot that fills up quickly during the evenings, and a few reviews have mentioned that the noise level is a little overwhelming at times. The tables and chairs are made of a very hard aluminum and have a 50’s diner style to them. The interior walls are painted a very pale shade of blue, and the hanging plants and fish tank brought some tranquility into the temporarily-relaxed atmosphere. 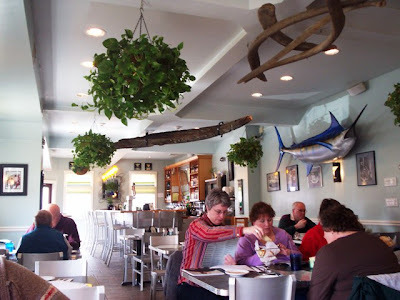 I especially liked the wooden planks on the ceilings and the giant swordfish art piece that hangs on one of the walls. It is very oceanic, but keeps with the classy vibe of the restaurant. 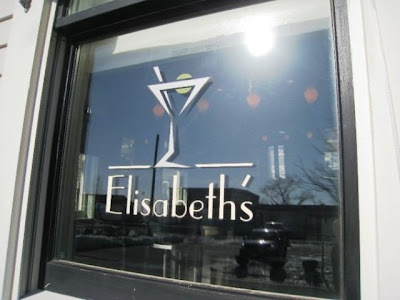 There is a large wooden bar at the front of Elisabeth’s with high bar stools that made Mom almost change her mind about dining here. Thankfully, she didn’t have to do any climbing as there are regular seats and tables located elsewhere. For an added touch, each small window has a martini class imprinted on the glass along with the name of the restaurant – very cute. Speaking of martinis, they seem to be the theme at Elisabeth’s. There are pictures of the drink all over the walls, and there is also a long list of delicious sounding martinis and assorted alcoholic beverages. One of the women at a nearby table ordered some sort of strawberry concoction that looked amazing. You could tell that she was absolutely enjoying that beverage while making her dining companions – and myself – quite envious. When our food arrived, everything looked excellent. However, we started to smell a lot of smoke coming from the kitchen area. A very pleasant gentleman came over to inquire if we would mind having the back door open for a few minutes. We didn’t mind at all. In fact, the fresh air gave our food a chance to cool down because everything was served piping hot. After giving her side of cole slaw to me (which was very cool and crisp), Mom dug into her fish. 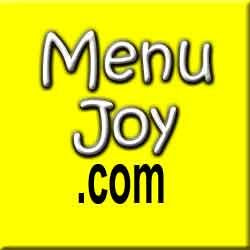 The filet was served English style, which meant that it was coated with a light, crispy batter. 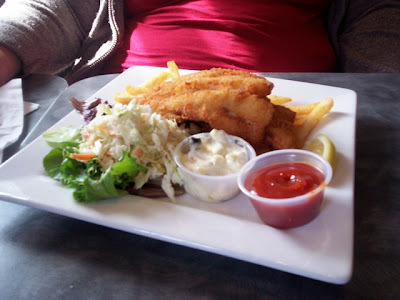 The portion size was perfect, and the fish was white, tender, and extremely well-prepared. A surprise with this meal was the French fries. Instead of a mountainous stack of greasy fried potatoes, there were a handful of appetizing, potato-filled fries which were served crisp and dry. In fact, Mom said that the fries were some of the best that she has had in a long time. Neither of us is that big on fries, and there is nothing that we hate more than wasted food. We would rather have ten delicious fries versus a pile full of grease that is just going to stay on the plate. My pizza was both colorful to look at, and colorful to taste. It had a lovely look about it with the red tomatoes, green spinach, and purple olives. 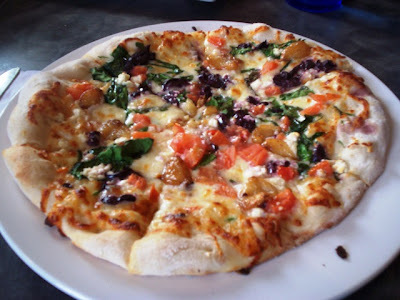 I was actually surprised to see Greek olives on the pizza as restaurants normally only use the black variety. It gave the pizza an extra tangy kick. All of the ingredients were very fresh, and the crust was sturdy and lightly crisp. What I like about the pizza choices at Elisabeth’s is that they don’t seem to be afraid of flavor. I noticed things such as figs, herbs, different cheeses, and colorful vegetables on the list of toppings. Good for them for allowing people to try things that they wouldn’t normally get on an average pizza. We left $22 on the table for Rochelle. She was very friendly and provided excellent service. Before heading out, Mom and I decided to use the restroom. It was spotless and uniquely decorated – especially for a bathroom. There was an adorable scented teddy bear, and a signed poster from the musical Hairspray hanging on the wall. I should mention that when we first pulled up to Elisabeth’s, Mom and I noticed another restaurant that is located on the same block. It is called Margaret’s, and Mom informed me that they are sister restaurants. If Margaret’s is as good as Elisabeth’s, we will definitely be paying another visit to this quaint part of Fairhaven. Elisabeth’s really delivered in terms of food, price, and service. Although a bit more upscale than some of the nearby restaurants, you are sure to get a good meal while taking in the contemporary atmosphere. Elisabeth’s is closed on Monday, but open from 11 a.m. to 9 p.m. Tuesday through Sunday.